After my pretty rubbish experience in Odessa, I am still on my mission to find Dublin’s best Brunch. 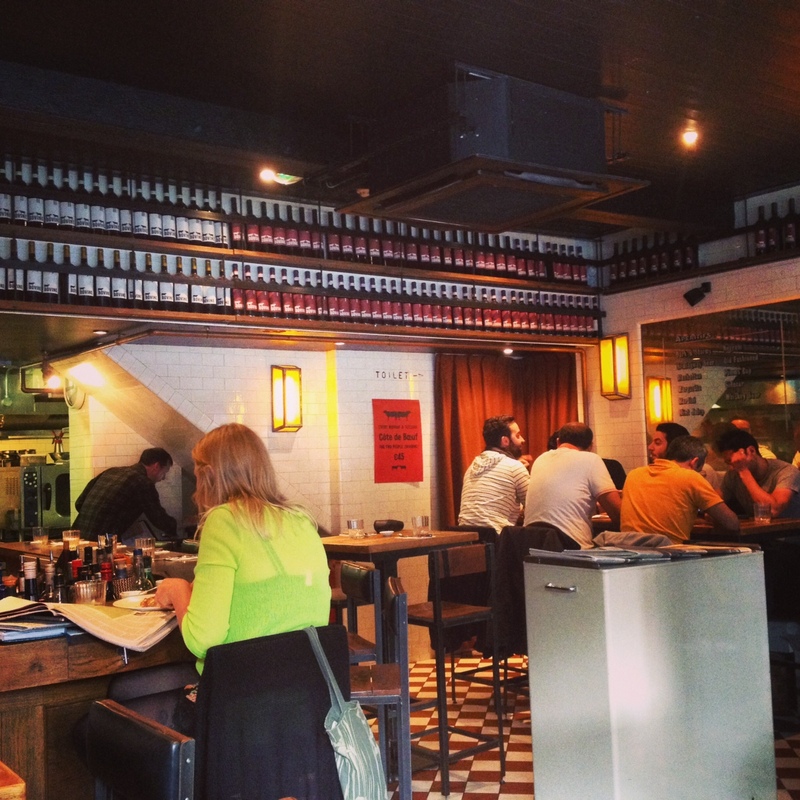 So recently myself and E popped into The Butcher Grill in Ranelagh to see how theirs fared! I’m no stranger to this restaurant group having tried brunch in Dillinger’s (which was great) and numerous visits to 777 which is one of my favourite dining spots in Dublin. These guys just seem to have the casual dining thing down to a T.
We got a great seat at the window… letting us people watch onto Ranelagh’s busy main street. The restaurant is smaller than I thought and has a really laid back feel, similar to the vibe in their other establishments with tiled walls, bar seating and high tables and stools. 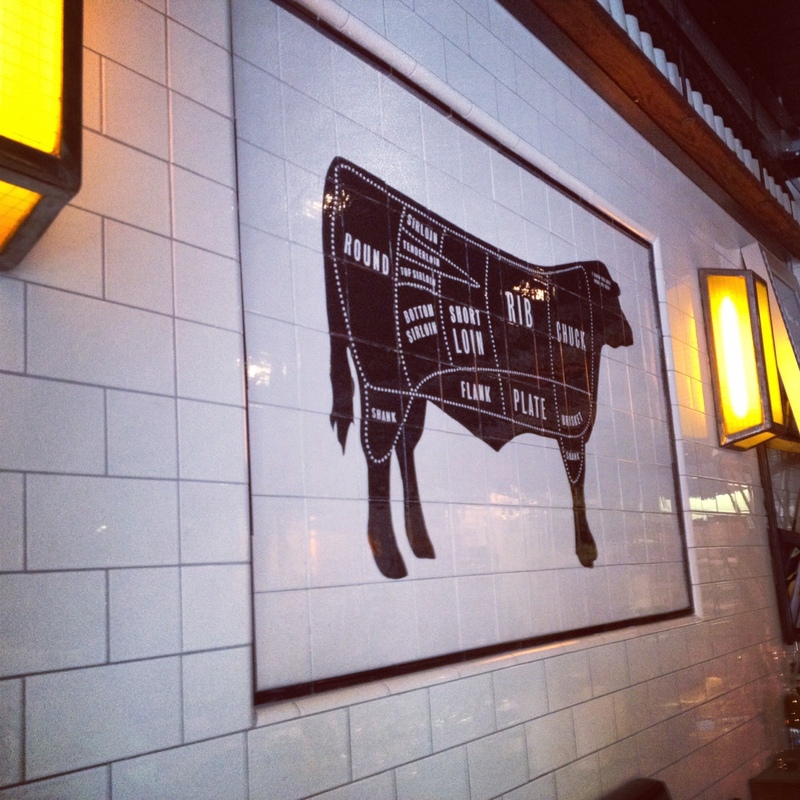 As you would expect from the name, the quality of meat is what this place is known for… this tiled cow on the wall details all the cuts of meat. We got straight into the Brunch menu. There’s a section of smaller bites that include Soup of the day, Raw oysters, White pudding Scotch egg, Prawn Bruschetta and Wild Mushrooms on toast with camembert cheese. The larger plates section offers a standard Mixed grill, Corned Beef Hash with poached egg, Eggs Benedict, Beer battered monkfish with chips and tartare sauce, Beef burger with chips or Ribeye steak with poached eggs. I would have bet my life on it that E would go for the Mixed Grill as he does EVERY TIME! But he was in the mood of a burger so went for that. I wanted a few picky bits so chose the Scotch Egg & Mushrooms on toast. 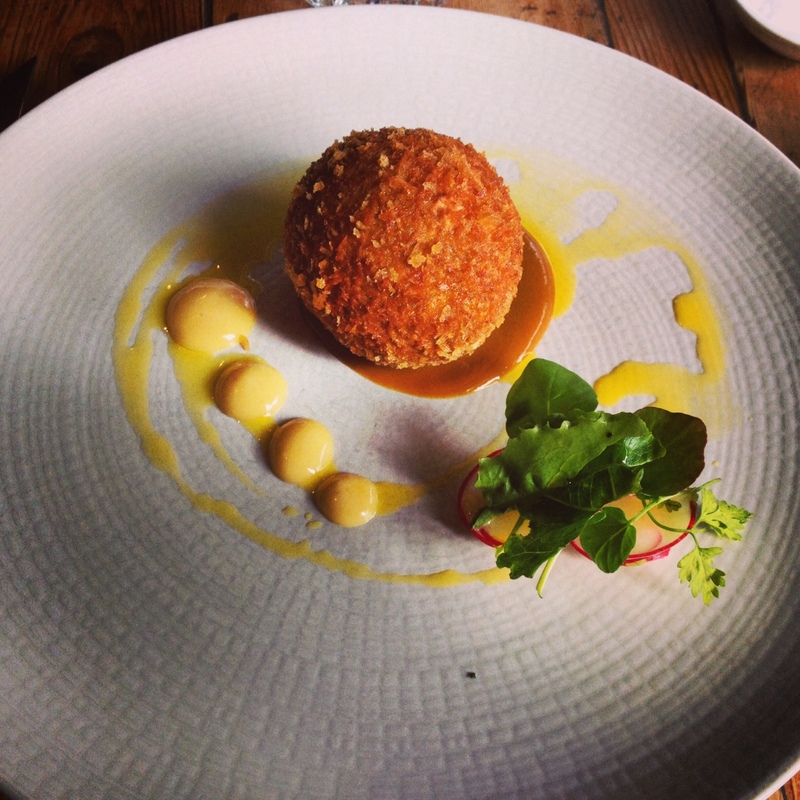 It’s YEARS since I’d tried a Scotch egg so was excited to try this one. Presentation was great when it arrived. When I cut into it the inside was lovely and runny, just how I like it. The white pudding went perfectly and just added a subtle taste to the dish. 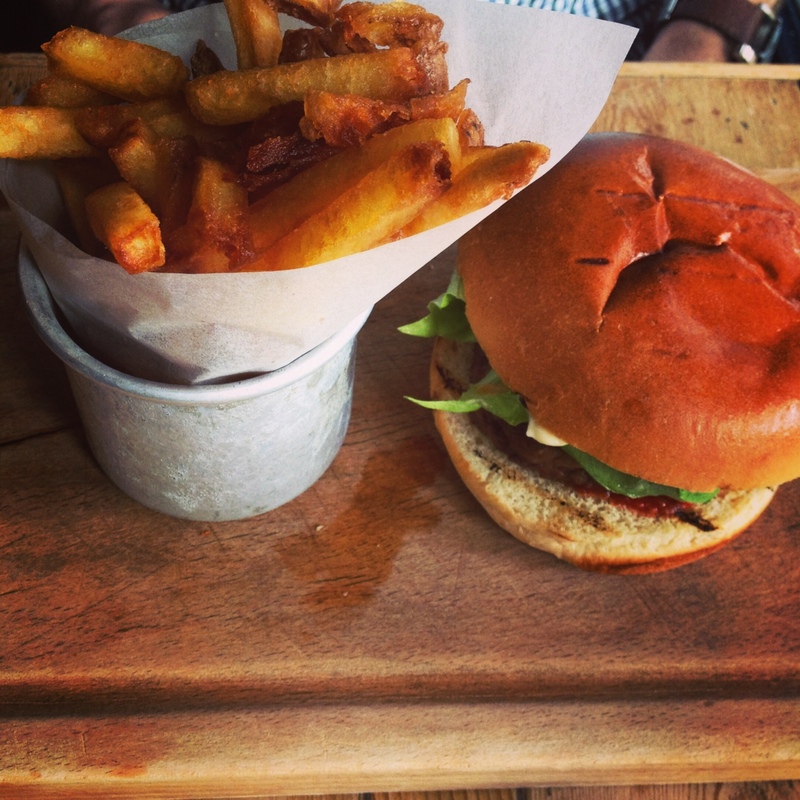 A special mention for the sauce put simply as “house brown sauce”…. it was unlike any brown sauce I’ve had and was delicious! Next up was my mushrooms on toast. I am annoyed that I didn’t take a better pic when I’d moved the leaves from the top. There was a good variety of mushrooms on lovely crisp toasted bread and the slices of Camembert were creamy and smooth. 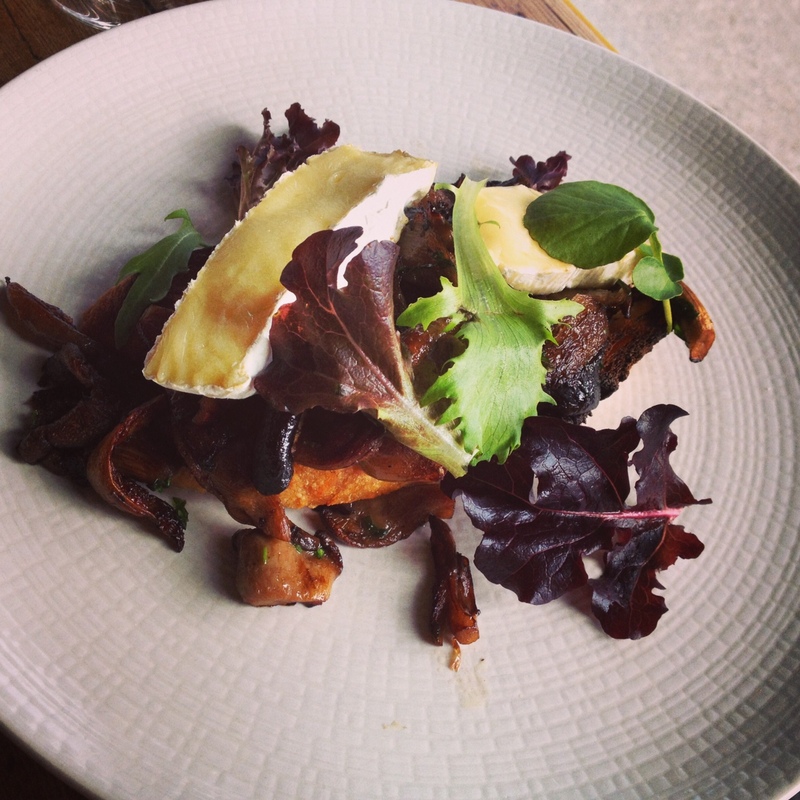 I adore mushrooms and adore cheese so loved this dish! No room for dessert this day I’m afraid! 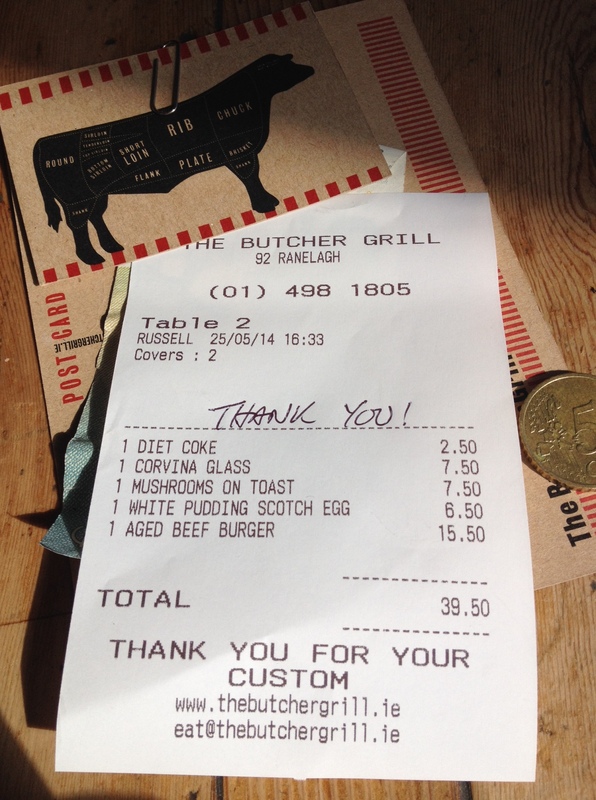 Total bill including a glass of wine and a soft drink was just under 40 quid – very reasonable for some fantastic food! The Butcher Grill is famous for their Cote de Boeuf deal they do on a Monday and Tuesday and I vow to return for this! Anyway, just the woman. 5 wimmin, Dublin city-centre, Saturday evening around 7ish. Where would your good self recommend a decent nosh-up that’s easy on a diversity of tastes, and our wallets? Apologies if I should’ve posted this in the Q&A section. Nope posting here is perfect 🙂 Not sure if you are looking for full meal or more wine and light bites etc but here’s some options. Would recommend booking all and any restaurant in Dublin on a Saturday night as it can be busy even at 7pm! That’s great, Kate. Much appreciated. Tired of the usual so that’s given me plenty to choose from. Will let you know where we end up. Good woman. Ta. 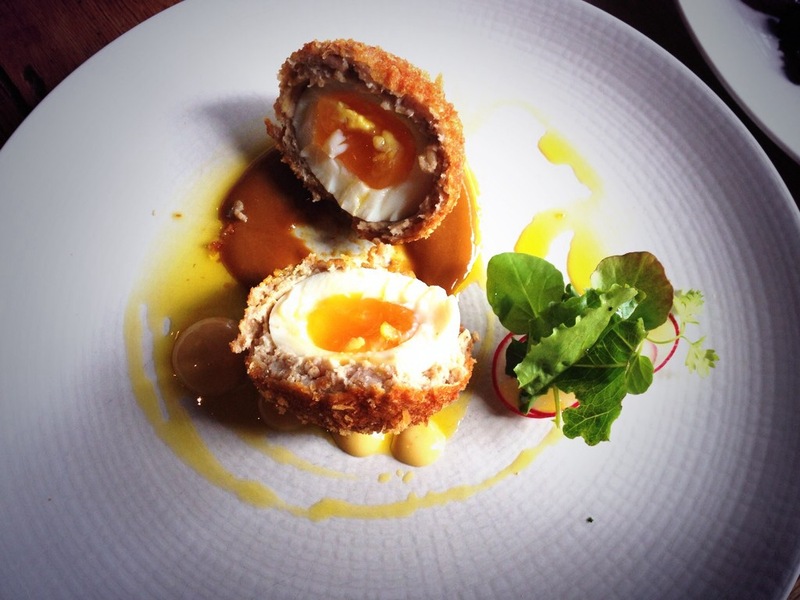 MMM that Scotch egg looks gorgeous 😛 Such a craving for one now!!! The burger looks awesome too!